Building your own house is a popular route to home ownership nowadays, as available existing housing is more difficult to come by than it used to be. The freedom that comes with choosing your own floor plan, finding your own lot, and overseeing the building process to ensure your home has the appliances and finishes that you want makes this an attractive option, but it’s not without its drawbacks. Here are some of the most common mistakes that people make when they decide to build their own homes, so you can avoid potential pitfalls and have a successful build that rewards you with a fantastic home in the end! The Berkshire (THD-1028) has many of today’s most in-demand features. 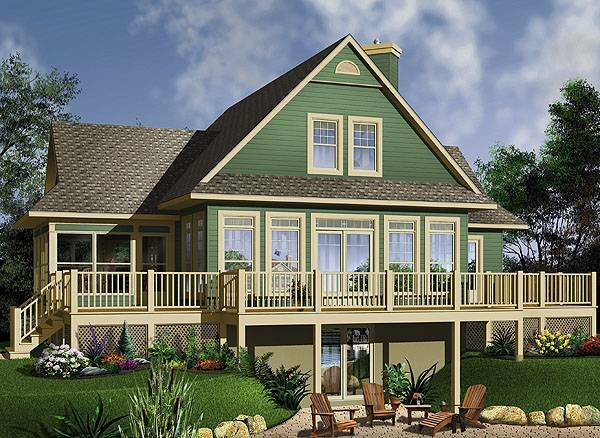 It’s no wonder this four-bedroom country home is a customer favorite from our Affordable House Plan Collection. This can be a problem no matter how you intend to procure your home. Many people get caught up in the limitless possibilities and have to be reigned back into reality. Come up with a reasonable budget and list of absolute must-haves when you’re looking for a new home. 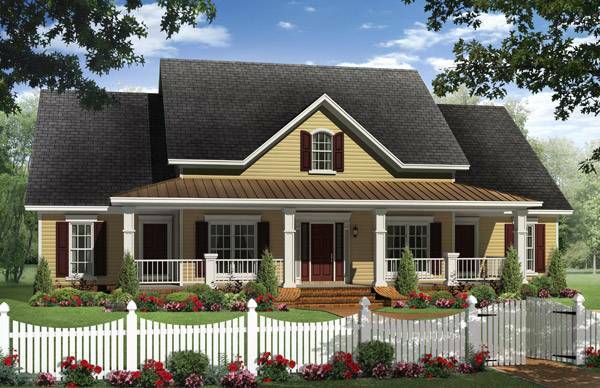 There are so many house plans out there that have what you need in beautiful, economical, and even luxurious packages, but you won’t find them if you think you want a bigger house with grander details from the start. While anybody can have this desire dilemma, people who choose to build their own homes are more likely to get a harsh wakeup call later in the game. Rather than being shown a variety of houses that are within their price range by a realtor, those who build themselves can get caught up in the abstract. The price difference between blueprints for a reasonable home and an extravagant one might be negligible, but that does not translate into the same cost to build and to own, by far. So, decide on a sensible amount of square footage for your budget and make that list of necessary amenities you will actually use often—how many bedrooms and bathrooms, what kind of kitchen, an open floor plan to make more use of less space or a traditional layout with defined areas, etc.—and then narrow the search to find what you can afford. You still get to finish the house how you see fit, and it will turn into your own home even if it seems lackluster at first. It is so much easier to find a home to fit a specific lot than it is to shop for suitable lots for a house plan you decided to buy early. Architects design for all kinds of land issues, but it can be very difficult to alter land for a house that clearly was meant for a different grade. And you never know what kind of lots will be available in the location of your dreams—they might be narrow, sloped, or even come with special zoning and building restrictions that force you to change your plans. Once you have your land, start the house search! It will save you a lot of frustration and heartache. The Pocono 2 (THD-1150) is a fantastic small cottage with three bedrooms in a split arrangement. Large windows make it perfect for a view lot, and it also adapts to a slope to give you a convenient walk-out basement. Of course you want a home that suits your entire family. What that means exactly differs widely across the board. Do you want to start a family or have young kids, or have your children grown into pretty independent human beings already? Grouped bedrooms are great for when you have to take care of little ones in the middle of the night, but split bedrooms are ideal for maintaining privacy and keeping the master suite quieter when the kids have grown. You should also consider how you use your space—is the kitchen a place where you like to work alone, or is it the command center for the entire household? Choose a house plan that can serve the needs and personalities of your family, so you don’t feel like the house impedes the natural energy and character of the people living in it. It’s a fact: the smaller the house, the more expensive it is per square foot. A small house still has the most expensive parts—the kitchen and bathrooms—but less of the cheap-to-build open space that makes up bedrooms and living areas. So, it might seem like a no-brainer to buy a bigger house because it’s a steal, with a lower average cost per square foot, but this can get you into trouble with maintenance and taxes. Sometimes people decide that shrinking the overall space will save them big, but they usually end up unhappy with cramped living quarters and don’t save much because they don’t address the most expensive rooms of the house. Set expectations for rooms individually. If you cook efficiently or eat out most of the time, decide on a smaller kitchen to save money. Don’t invest in it if you don’t actually need it. And be realistic about the amount of space you need elsewhere—too much and your bills could get out of hand, but too little and your home won’t be comfortable and relaxing. We like interesting things. A house that stands out immediately gets our attention, but it usually comes at a large cost. A square footprint is economical to build and to own, as it maximizes volume to surface area to give you the most space for its price. A rectangular shape is usually very reasonable, too. Problems can arise when you start adding more bends and corners, because they have a huge effect on the structure of the roof—and that can get expensive. Make sure you can afford the cost to build a more intricate plan before you buy the blueprints. That said, focusing on the simplest footprints might not always provide you with options that you like. For instance, you can’t really have a large one-story home with a square footprint, because light from windows can’t possibly reach the center, and it would feel very dreary. A home with its square footage stretched out will give you more daylighting and a brighter and breezier feel that’s way more enjoyable. Anybody would appreciate the flowing layout of Mason (THD-2458), but it is actually specially designed so wheelchairs can move throughout the home unimpeded. 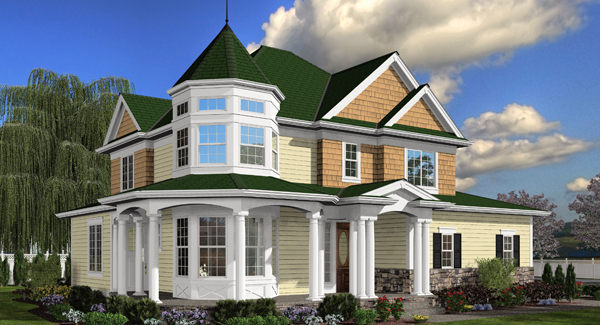 See more plans like this in our Accessible House Plan Collection. Think about the future when you’re planning to buy or build a home. Do you plan to move as soon as the kids are on their own, or do you want to live in your home well into your golden years? Be honest about it. A house with universal design has wider hallways, spacious bathrooms, and fixtures that are easier for people with mobility issues to use, but that doesn’t mean you won’t still love it before you actually need the extra consideration. If you want to age in place, look for accessible homes. And if you still end up moving, you’ll find that they’re in high demand, anyway! You can appreciate cubic volume, but you can actually live in square footage. Make sure you get the square footage you need before looking for high and vaulted ceilings, because while they are beautiful and can help you naturally illuminate from above, they are otherwise unusable. Cubic volume ends up being expensive, because of the cost of building the necessary structure to support loftiness and because you lose heat to it in the winter. There’s no question that, as a design element, the wide open space created by raised ceilings is attractive and in demand, but that’s no reason to give it priority over space you could actually use to live. Modern architecture tends to do away with as many halls as possible, because they don’t really provide livable space. Wouldn’t it be better to get the most out of your square footage by putting into bedrooms and the living room? That’s the goal that the popular open floor plan with split bedrooms tries to achieve, and it often does, but that doesn’t mean that it is automatically the best answer for everybody. Think about older homes with hallways—those halls are great transitional passages, often lined with pictures and other personal decorations, and that wall space is sentimental and precious. The walls and the air sandwiched between them also help to buffer against noise from around the house, so there are practical benefits. The key is balance; you don’t want to waste too much of your square footage on hallways, but well-placed hallways can definitely be worth it. Windsor (THD-3289) offers both traditional style and modern demands. The first story has a spacious great room and a private den, while three bedrooms, a study area, and the laundry room are upstairs. Back to setting and minding your budget, you want to make sure your home is everything you want, but needs are paramount. Don’t spend money on things that are only nice and not particularly necessary. Unless you’re opening a romantic ski lodge, every bedroom doesn’t need a fireplace. That very pretty but also very costly kitchen faucet won’t supply water of a higher quality than one in a less expensive finish. Having more bathrooms than you’ll actually use is a surefire way to eat up your budget and make less of your square footage usable. Focus on practicality and you’re more likely to get the most out of your home, and it will be better to live in on a daily basis. The final step to building your home is setting it up so you can actually live in it. If you intend to use furniture you already own, you have to measure it and consider the dimensions of house plans before you settle on one. If you are going to buy new furniture, don’t let the total design freedom overwhelm or get away from you. Bedrooms can and should be personalized with the colors and style that the people who live in them like, but common areas are usually a little more general—that is, they have a more subdued, probably neutral palette that everybody can agree on. Decide what you need, how you want it to look, and you won’t end up with a bunch of mismatched pieces that you love individually, but that look like an eyesore when placed together.